While there are a plethora of positives from online shopping, we all have to admit that sometimes eCommerce simply can’t live up to the experience of shopping in-store. Luckily, due to the open-source nature of many platforms like WooCommerce and Magento, there are ways to combat these disadvantages. We’ve highlighted five ways that really bring eCommerce up to the standards of in-store shopping experiences. It’s no secret that the main thing the fashion industry lacks online is being able to try before you buy – clothes hang and fit differently on everyone, and the likelihood of the product fitting exactly as it does on the model is low. This issue uncovers another – returns – though more on that later. Though a try ‘before you buy’ service is impossible to entirely combat until we invent teleportation, some stores have cleverly utilised the technology we already have at our fingertips. 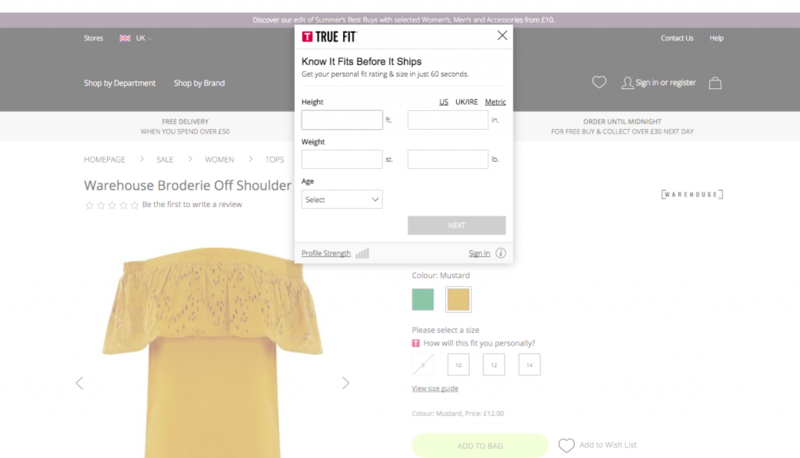 House of Fraser have a feature where the goal is to calculate exactly what size you will need for a particular product, based on body measurements and how other brands fit you. It saves your profile as you go, getting more accurate the more you shop. True Fit is super clever, and extremely useful in order to combat the main disadvantage of clothes shopping online. How annoying is it when you purchase something online but you aren’t allowed to return it in-store? Post Offices in the UK don’t open outside typical working hours, which means sending something back takes up your entire lunch break. More and more stores are accepting online returns – and not only does it make online shopping a better overall experience, but it means increased footfall in-store, which provides a better chance of the online customer converting in-store too. Win-win. (We wrote more about this here). Ikea have always been at the forefront of innovation, and 2017 is no different. They’re currently creating an Augmented Reality App which will allow users to try out virtual products in their own home, via a phone or tablet’s camera, before purchasing online. Sadly, this option is a little outside the average company’s marketing budget. 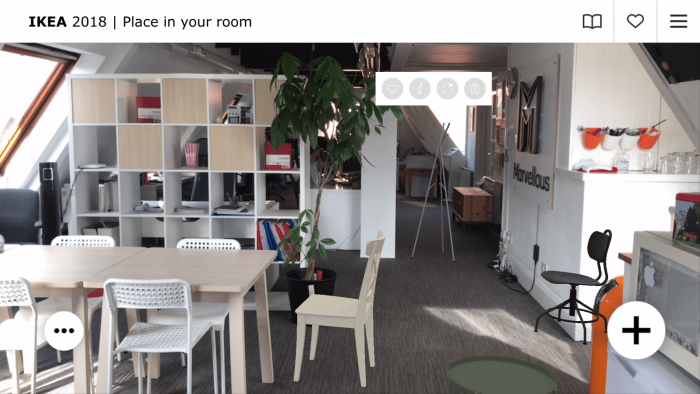 Ikea currently has in its Ikea Catalogue App a ‘place in your room’ function, which allows you to select items and, with your phone’s camera, ‘place’ them in your room, in real time. There don’t seem to be many products you can do this with, and the colours seem slightly off compared to our actual Ikea products, but it’s a fun and innovative way to visualise how a product will look in your own home! While the Ikea product placement is certainly incredible, it’s still in need of a bit of work (and a few more products to add to its catalogue!) to get it spot on. Shopping in-store allows the consumer to ask questions and get general assistance from staff members, something you just can’t get online. Or can you? 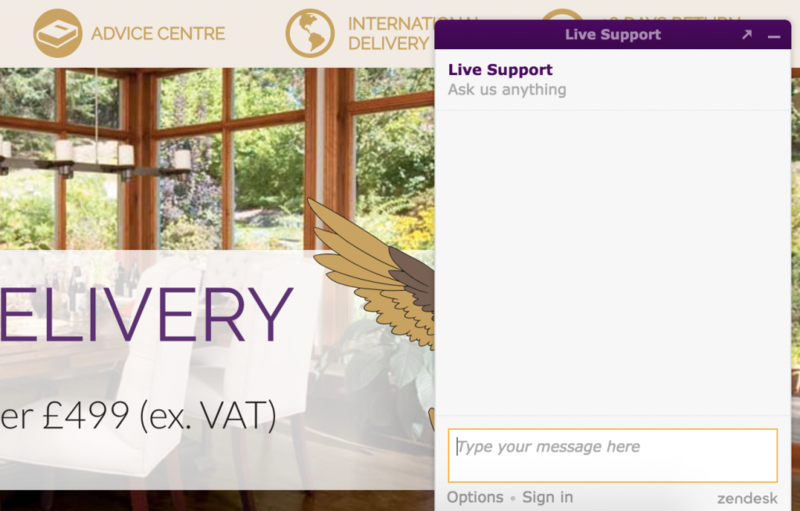 With Live Chat popups on websites becoming frequently more common, online shoppers are able to get the same level of help from staff without the hassle of parking and, well, other people. And of course, if you don’t want help, just minimise the tab and browse away! It goes without saying that a big factor when it comes to favouring in-store shopping is being able to take home your purchase that same day. The excitement of buying something online quickly dilutes when you realise you now have to wait 3-5 business days for it. That’s the reality of online shopping, but some retailers are able to combat this by offering next day delivery at a really low cost. Companies like ASOS and Next – who have presumably high profit margins – are giving their customers the option of paying a set amount for free next day delivery for an entire year. It’s definitely something that brings pros to customers but, with a risk of more returns, potential cons to the company. Of course, for many small and medium sized businesses this is not sustainable. However, just offering a next day delivery service is a big plus for customers. Research conducted by Dotcom Distribution found 47% consumers would pay more for same-day or next-day delivery purely because they wanted their package quickly, and 67% would pay more for a speedier delivery if they needed an item by a deadline. Surprisingly, their study showed that speed was actually more significant than price when it came to delivery. There are fundamental differences between in-store and online shopping, but with new functionality and technology coming out all the time, the gap is becoming increasingly smaller. What other ways do you know to combat the disadvantages of stereotypical online shopping? Let us know!